An amazing garage kit of Jin Seo Yeon, a famouse NPC in Blade and Soul, had been displayed at the Tokyo Wonder Festival 2013. When blade & soul gold saw these pictures of the details, can’t stop “WoW”. Look at the stocking! So real! Do the artisans have magic hands? The Tokyo Wonder Festival, or Wonfes for short, is a bi-annual event to display and sell “garage kits”, which are sculptures that usually replicate anime and game characters, but also popular mecha/sci-fi characters and creatures. These models are extremely detail oriented, and many of these sculptures appear in very small quantities due to the amateur nature of their reproduction. Unusually skilled artisans are promoted specifically during the “wonder showcase” (WSC), in which their works are given special attention and limited quantities of their masterpieces are sold for high prices to avid collectors. It also showcases future releases by major toy companies. Ghost Blade, a very powerful weapon belongs to Jin Seo Yeon, a famous NPC in Blade and Soul. 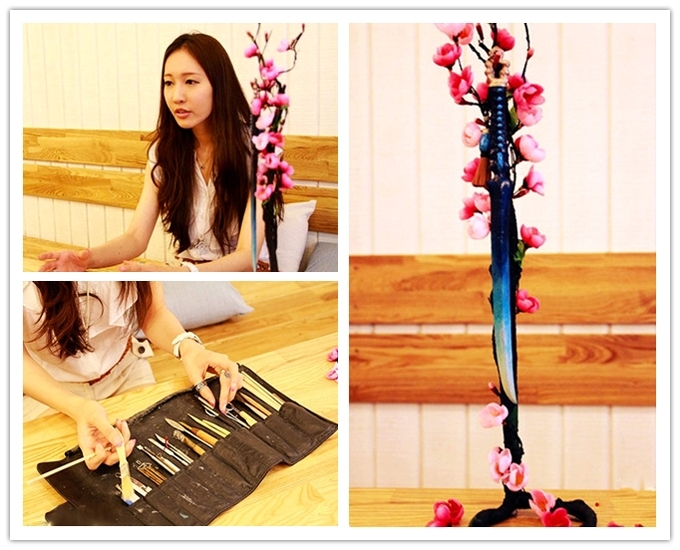 Recentely, a female Korean fan has diy this blade only by a concept art. It said that this fan is studying for a Doctor’s degree of sculpture major. You see how attractive the game is, and how powerful the fans are. Blade & soul gold is really pride of this.